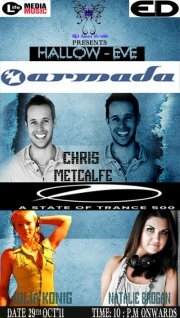 This Halloween get ready to be petrified,Sin Amor Events & VOX media & Pr bring you for the very 1st time in Pakistan,world's no.1 Electronic Dance Music Label A R M A D A & State of Trance DJ Chris Metcalfe (UK) Chris really has set the standards high, being signed by none other than the world's no.1 DJ Armin van Buuren to his Armada record label and tipped on BBC Radio 1 to be the next big thing. Thats not all, German House Music sensation Julia Konig . Not just that, As a sweet starter, listen to the covers of Maroon 5 by the band "SYMT". SYMT is the most talented upcoming band with their hits like "Zamana", "Nazrain Milien" and "Dil Ke Aankhoon Say". So get ready to experience the mixture of House & EDM on Hallow Eve.